And it also stays embedded in the adipose tissue in your body, until it’s released when fatty acids are required. Some say even if you stopped eating PUFAs tomorrow, it could take up to 4 years to clear from the body. So continuing to do damage long after you’ve eaten it. Holy crap! PUFAs are in nearly every processed food like breads, biscuits, sauces, dips, every take away food, the oils mentioned above, nuts, grains and animals fed on grains. So keeping away from it is pretty difficult to do, which is probably why our Omega 6 overload is such a problem. So apart from the crappy stuff it does on the inside of your body, did you see point 2 & 3 above? Age spots, sensitivity to the sun. And point 5 is a problem for your skin as well, as protein makes new skin cells. Oh no! So we know skin absorbs much of what you put on it and guess what nearly every skin, face and body moisturiser has in it? Run to your bathroom and check out the ingredients list. IN EVERYTHING! A person asked me “so really the problem only is when the oil is rancid right?” And technically this is true, however how it’s extracted – ie: using solvents and chemicals, what’s added to it to deodorise it and make it seem fresher for longer etc also play a big part. Some of the things they are turning into oil like rice bran, hemp seeds, sunflower, safflower etc it’s darn hard to do. Even if the oil was cold pressed and pure, the nut or whatever starts degrading as soon as it is shelled. It’s exposed to air and light and then has to journey from the shelling plant, to the oil making place, maybe bottled in big drums, maybe re-bottled into smaller bottles, sold to skincare manufacturers, who make the product, bottle it up again, then sold to wholesalers, sold to retailers, sold to you, where you store it in your bathroom until you use it up. You don’t know how long it’s been exposed to air, light and heat along the way. Has it been refrigerated the whole way through this process in dark tinted glass? I doubt it. Guess how long it is estimated that highly unstable PUFA oils last before going rancid? You can’t tell me that whole process only took 3 months! I have creams in my bathroom that have been there longer than that. In fact the useby dates on skincare usually give you at least 2 or more years to use it. What they actually should have on there is the manufacture date – but even that wouldn’t be accurate in terms of the oil’s age because the oil may have been produced years before. You may not be able to tell if the oil is still good or not because it has fragrances or other preservatives in it. But it still may be doing you damage! The only two plant/nut/fruit oils that have the lowest PUFA levels are coconut oil and macadamia nut oil. Rich, nourishing, made up mostly of saturated or mono saturated fatty acids and the most stable of oils. These beauties can last up to 2 years without going rancid. So this is what we need. And so I hunted and searched and some skincare products do have these two in it but then they go and wreck it by adding more oils like camellia oil, sweet almond oil, avocado oil, sunflower oil and all the essential oils which are high in PUFAs too. So apart from avoiding PUFAs in my diet, Coconut Body Milk is currently my go to option for my face, hands and body to keep the aging effects of topical PUFAs to a minimum. It is a light cream with no particular scent. At first it seems to sit on the skin, but you don’t have to use much; gently rub it in until it disappears. My skin feels soft and not at all dry like it can be. If I need it a little heavier, I just add a few drops of Macadamia oil, which I have in my bathroom anyway for cleansing the skin. 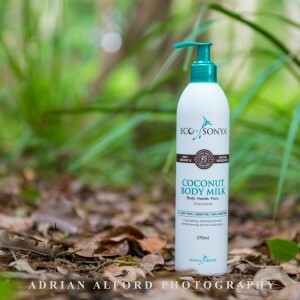 Both Coconut and Macadamia oils are healing for the skin and there are quite a few reviews for Coconut Body Milk saying it has had a healing effect for the user. So helping to avoid further damage and healing what is already there…sounds like a brilliant idea to me. 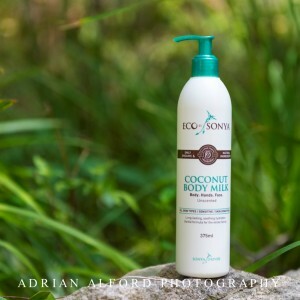 Coconut Body Milk by Eco by Sonya is available in many health food stores and pharmacies around Australia. Thanks to www.adrianalfordphotography.com for the images. There’s also http://www.absolutelypure.com which looks amazing. Hi Debbie, yes it does! I would buy some of their products too but they’re a bit far away from me in the UK. Great to see there are more popping up that understand the issues with PUFAs. What is the ‘Seed Oil’ ingredient? Is it part of the Macadamia nut ingredient or is it separate? Also, i’ve heard that glycerin actually dries skin in the long term by pulling the water from the deeper layers, Do you think this problem would be permanent? I wanna have an army of go to moisturisers when im desperate and i should imagine this moisturiser would work well. Is xanthan gum an issue?